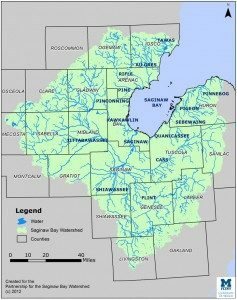 If you live in one of the 22 counties that are a part of the Saginaw Bay Watershed your land drains to Saginaw Bay, Lake Huron. Our watershed contains more than 175 inland lakes, about 7,000 miles of rivers and streams, and contains America’s largest contiguous freshwater coastal wetland system! More than 1 million people call the Saginaw Bay watershed home and live in cities, suburbs, and farming communities. The Saginaw River and Saginaw Bay were designated as an Area of Concern by the International Joint Commission in 1987. According to the USEPA, an Area of Concern (AOC) is a region along the Great Lakes with water quality problems and degraded environmental conditions which are likely to cause impairment of beneficial use or of the area’s ability to support aquatic life. The Partnership for the Saginaw Bay Watershed was formed to coordinate efforts and monitor progress toward restoration goals with an ultimate goal of removing the Saginaw River and Bay from the list of AOCs throughout the Great Lakes. The PSBW is the non-governmental oversight organization created to coordinate the information and activities regarding the Saginaw Bay Watershed Area of Concern.